Main Street Booch - Word on the street with Visit Minot!Word on the street with Visit Minot! Kombucha is a fermented probiotic fizzy tea. It is made from a SCOBY– which stands for a Symbiotic Culture of Bacteria and Yeast– and Sweet tea. The SCOBY eats up most the sugar and ferments the tea. After it ferments it is flavored and carbonated. Its probiotic qualities are great for your gut health — cleans up all your digestive issues. Kombucha also has electrolytes, B vitamins, and will help balance the PH in your system. 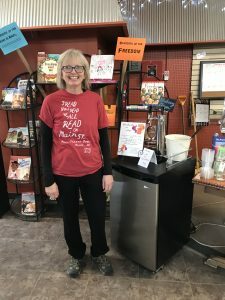 The owner of Main Street Books in Minot, Val Stadick, started making kombucha when she picked up a bottle out of curiosity in the grocery store. Her first drink she thought well . . . that’s different. By her third drink she was hooked and, like anything she loves, she had to figure out how to do it herself. And just like that, Main Street Booch was born. They now brew it IN Main Street Books and sell it there. They change out their flavors all the time and Val is always experimenting and changing things up. Lemon ginger is one of the favorites. They use herbs and flowers in their flavors — hibiscus and lavender mostly. Val brews it in large vats with the homegrown SCOBY on top of a batch of sweet tea. It ferments with a cloth cover (so it is getting oxygen) for anywhere from 10-21 days depending on the time of year and temperatures. After that time she removes the SCOBY and the top of some of the starter liquid and adds that to a new batch of sweet tea. 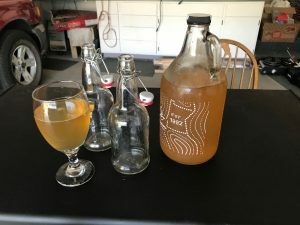 The fermented tea and flavoring is either put directly into the keg or it is put in another vat to infuse with the chosen flavor for another three days. They are building a kombucha brewery in the basement of the bookstore and will be expanding the flavors to offer 4-6 different flavors on tap daily. They are also hoping to put in some small tables in the store and create a small seating area — a place to sit and browse and drink something that you feel good about putting into your body. They are also hoping to bottle the kombucha so customers can just run in and grab a bottle. They have refillable bottles now and they have 64 Oz. growlers that people can buy and refill. They encourage people to bring in their own bottles because of the near-zero waste that creates. They will fill up any clean bottle that people bring in. 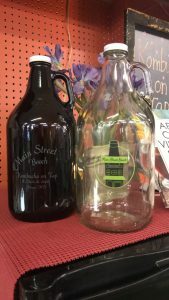 As of right now, Main Street Books is the only place you can buy their kombucha, although Val does plan on attending a few events in the parks and elsewhere. She made an innovative move and made a kegerator out of a freezer and will be hauling that around. You can visit their Facebook page, Main Street Booch, to learn more about it!